You are here: Home / Uncategorized / The Book’s Out! Now About Those Expectations…. The Book’s Out! Now About Those Expectations…. If you self-publish, don’t expect to quit your day job. Not right away anyway. It’s probably one of the biggest myths about self-publishing. Ask anyone in the publishing industry and they’ll tell you the same: don’t quit your day job. Not until you can financially provide for yourself. Or in my case, for a famil y. 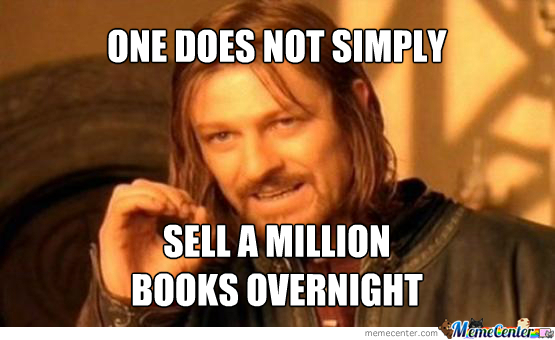 A lot of folks get into publishing and think they’ll sell books like Stephen King. Well, you may be able to write great thrillers like Mr. King, but does anyone actually know you? Do you have a dedicated base of ready-and-waiting readers? These are questions you need to ask yourself before you hand in that two-week notice. Pay the bills first. Then, ride off into the sunset with book in hand. Get the word out. I laugh when I think of how my first book release went down. My book went to the market and after it did, I think I checked my sales rank on Amazon about twice every 15-30 minutes. Up I’d go, then I’d be down again. Up, then down, up, then down… you get the picture. It was maddening. But then again, I was totally new to this publishing thing. And remarkably impatient. So there were some lessons to be learned before I could call myself a true “author.” Namely, I had to be more conscious of marketing myself. Do I have a Facebook page now? Yep. Twitter? That too. A blog to talk about this stuff? Self-explanatory. And lastly (and perhaps most important of all) was I reaching out beyond my own social circles? Or was I content getting a thumbs up from my aunts and uncles? Well, that’s another item I can check off these days. Guest blogging, for instance, is something I’ve been fortunate to do as of late (you can check’em out here and here for the latest). So I’m becoming less and less afraid of telling people about what I do. Because in the early going, the books just won’t sell themselves. The Road to Mars is a fictional novel, not a non-fiction or a short story. My first two books were non-fiction works. And in addition to that, they were satirical in approach and delivery. That’s a stark contrast to what I’ve done recently. But in order to make that transition possible, I started a little project where I’d try to write a short story every month. I tentatively called it #12Months12Books and I did this for much of 2014 and 2015. It was probably one of the most difficult – and asinine – things I’ve ever taken upon myself to accomplish. Not only was I under the delusion that I could write a short story every month, I also thought I could polish, edit, and release said short story in a timely fashion (without staying up all night wondering if I’d done right). In hindsight, that was a really difficult undertaking. But, I got through it. Till about June. Which is where reality sank in and I had to stop. But as always, there’s something to learn from the experience. Namely, writing short stories are like writing miniature novels. They force a storyteller to break down the mechanics of storytelling as a whole. Character, plot, setting, motivations – the works. All of these elements have to be trimmed down so that when you’re ready for the “big leagues”, you can have something to work with. Reviews, reviews…and hey, more reviews. If there’s one thing an artist appreciates, it’s feedback. Whether it’s showering praise or having tomatoes being flung (does anyone still do that? ), the result is the same: it’s a response. A reaction. An opinion to what the author has put out there for the enjoyment – or disenchantment – of his audience. Which is why I am humbly asking any and all who read my book, to please review my book too. Five stars? Four stars? No stars? Well, I suppose that’s up to you to decide if it deserves a “zero” rating. In which case, I might offer an apology. Or cry for a while. I just won’t write about that part if it happens. The Road to Mars is out and only available on Amazon so by all means, check it out if you haven’t already! Have a great weekend, folks.